The commercial taxes department has decided that goods worth Rs 2 lakh would not require an e-way bill in case of intra-state transportation, providing a major relief to traders. Deputy chief minister Sushil Kumar Modi, who heads the commercial taxes department, announced this on Wednesday while speaking at the launch of the e-way bill portal. The new system will become compulsory from Thursday for transporting goods from one state to another or within the state. being seen as a corollary of the GST regime that came into effect from July 1 last year. 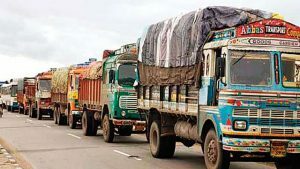 Under the new system, manufacturers and traders who send goods from one place to another would have to generate an e-way bill if the transported goods are worth more than Rs 50,000. The purpose of the new system is to keep a check on movement of goods from one place to another in the country. A dedicated website www.ewaybill.gov.in has been created for generation of the e-way bill for which no fee has to be paid. There will be no need to visit any office for generating this bill as it can be created only online. The Rs 50,000 limit would be applicable to inter-state movement of goods. For transportation within the state, the respective governments have been given the right to enhance the limit. Bihar has decided to raise the limit to Rs 2 lakh, Modi said. Transportation of petroleum products, which don’t come under the ambit of GST, would not require e-way bills. Bihar will also set up a helpdesk that would function from Patna. It will function from 7am to 11pm. The helpdesk would become functional from Thursday. Those facing problems can call on the numbers 0612-2233512/13/14/15/16, or mobile numbers 9472457846/9199273130 or toll-free number 18003456102 for clearing their doubts. Helpdesks would also be set up in the districts. Modi urged traders and businessmen to adhere to the rules and be partners in revenue generation. He said teams of officials would start checking vehicles from Thursday to ensure e-way bill compliance.